and marketed by a company Datawind. As per the company the tablet will be available in 2 versions, one commercial version and other non-commercial. The non-commercial version will be available at $35 as was declared a month back. The non-commercial version will be supplied to government for enhancement of IT revolution in India. The actual price of the tablet is a bit higher than $35 but it will be subsidised by the funds from Government. On the other hand the commercial version of the tablet is integrated with an inbuilt cellular modem and a SIM card to provide internet access to the user which is not present in the non-commercial $35 device. 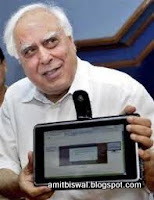 As per the company the tablet ‘aakash’ will run on Google’s Android Operating System with wifi internet connectivity for access to internet and cloud storage. ‘Aakash’ tablet PC will be having a memory of 256 MB RAM with storage memory of 32 GB supported via memory card slot. This device also contains 2 USB port for data transfer. As per the company Datawind, the non-commercial version of ‘Aakash’ which is priced at $35 includes sales tax and warranty for replacement. The company is expecting a good margin especially from the non-commercial version because since it will be supplied to the government so the volume of sales is expected to be higher than those of the commercial version.